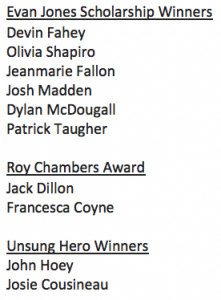 As we approach graduation this Sunday, June 3rd, we have had a week of celebrations at Milton High School as we have honored our outstanding students for their achievements in academics, athletics and music. 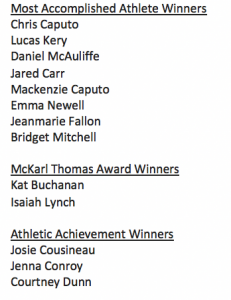 These are special nights in the Milton Public Schools and I know you’ll join me in congratulating the recipients and thanking those who make these evenings and awards possible. 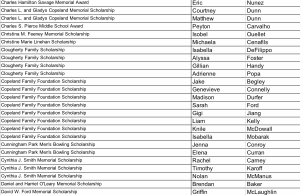 Congratulations to Milton High Schools seniors for the academic awards presented to them this week. 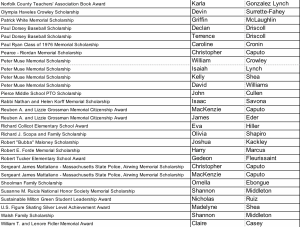 A special thank you to the families, organizations and foundations who donated over $130,000 to this year’s MHS seniors. 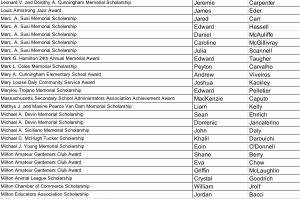 This night is amazing as we honor many of our students with scholarships and awards. 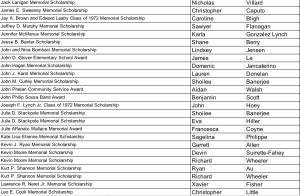 All names below can be enlarged by clicking on the photo. 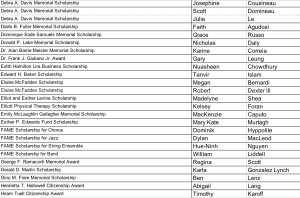 Congratulations to our Academic Award Recipients! 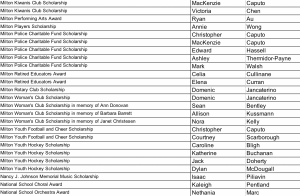 FAME held their annual banquet to honor our musicians and as it is every year, it was a moving evening. 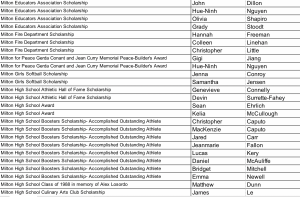 Students were honored for leadership, spirit, improvement and more. 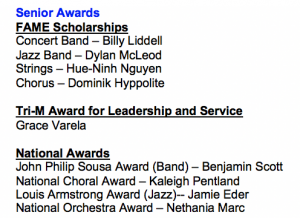 Our musicians grow exponentially during their time at Milton High School and it is wonderful to see them recognized. The Boosters rounded out our awards season with a terrific banquet just last night to honor our athletes. 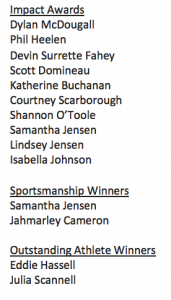 Athletes were honored for their sportsmanship, achievements on the field and court, athleticism and more. These events would not be possible without the support of many people. Thank you to the parents/guardians of FAME and the Boosters, MHS Principal James Jette and Assistant Principals Ben Kelly and Brian Mackinaw, Administrative Assistants Maureen Kennedy, Brad Spindle and Patty Johnson and Athletics Assistant Kristen Lesser for their contributions to these special nights. 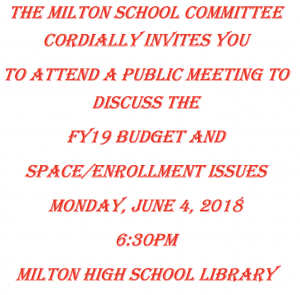 The Milton School Committee would like to invite you to a public meeting on Monday, June 4th at 6:30pm in the Milton High School Library. The purpose of this meeting is to discuss the FY19 budget as well as space/enrollment issues. 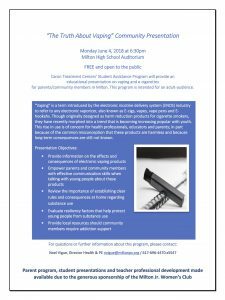 This Monday, June 4, at 6:30pm, please join us in the MHS Auditorium as we are pleased to present “The Truth About Vaping” , A Community Presentation. This presentation is FREE and open to the public. The Caron Treatment Centers’ Student Assistance Program will provide an educational presentation on vaping and e-cigarettes for parents/community members in Milton. This program is intended for an adult audience. Look who was at MHS this week and last? 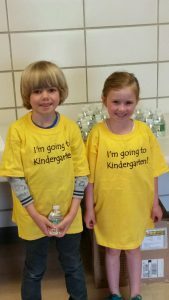 Our incoming kindergarteners were here, meeting some K teachers and school nurses. 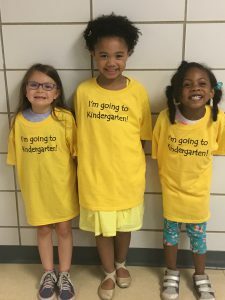 Everyone leaves with a smile and a bright yellow t-shirt. 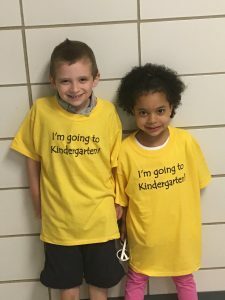 Welcome to the Milton Public Schools, class of 2031! The Health & PE Team at Pierce ( Bernadette MvEvoy, Brendan Bonn, Colleen Queally John O’Leary Pam Noonan, and Barbara Perry) would like to spread awareness about sun safety as summer approaches. We all want to get outdoors and enjoy the sunshine, and we want you and your families to stay safe and protect your skin. The Friday before Memorial Day is dubbed Don’t Fry Day and this is a good time for a reminder about sun safety. Protect your skin today and every day! Enjoy the summer fun, but always remember to Slip, Slop, Slap … and Wrap! Slip on a shirt, Slop on some sunscreen, Slap on a wide-brimmed hat, Wrap on some sunglasses! 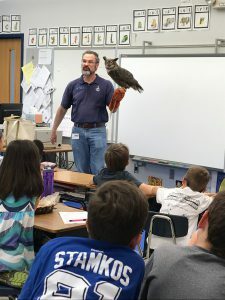 Our 3rd graders at MPS recently enjoyed Owl Talks Presentations by Trailside Museum naturalists, where they learned about owls and the importance of respecting and caring for wild animals. 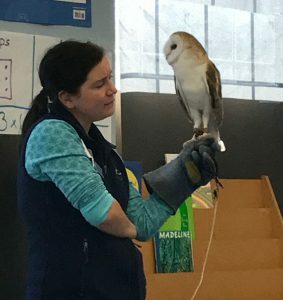 During the presentations the students explored owl wings, claws and skulls to explore how these structures are adapted to meet the needs of these birds. They also had the opportunity to meet some live owls (Great Horned, Barn, Screech, or Barred). All of these birds are native to the Milton area. This lesson will be followed up with an in class owl pellet dissection, when students will be able to explore the skeletal remains of the food supply of these local owls. 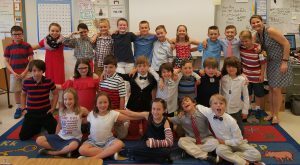 Mrs. Spitz’ 3rd graders looking sharp on their way to sing! During any given week, there is usually a musical performance of some sort happening at one of our schools! Please enjoy our Collicot 3rd graders and Tucker 2nd graders performing at recent concerts. They laughed, they cheered, they tied! 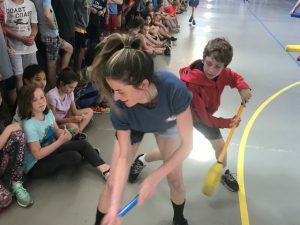 This year’s Glover 5th grade vs staff Pongo game did not disappoint! 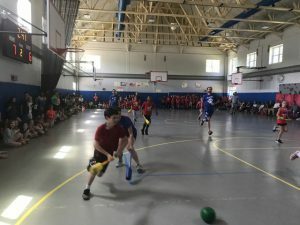 The excitement was palpable and the kids had a blast. 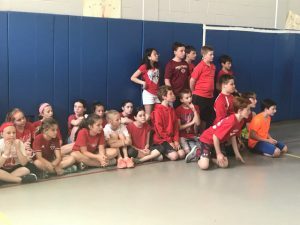 The fourth graders can’t wait for their turn next year and loved cheering everyone on. 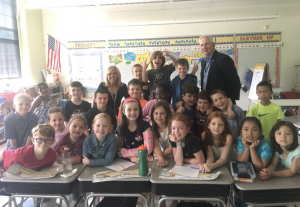 Thank you to current Selectman and former Police Chief Richard Wells who spent some time with Mrs. Walsh’s 2nd graders at Cunningham this week. It’s official, Milton High School will be going to Bring Your Own Device (BYOD) for the 2018-19 school year. Students will be asked to bring their own device, other than a smartphone, to school with them each day. For students who will not be able to meet this request, a Chromebook will be loaned out to the student by Milton Public Schools for the school year. At this time, we ask all 8th-11th grade families to declare whether or not your student(s) will be able to bring their own device next year. Please complete this short declaration survey by Friday, June 1st. For more information regarding the BYOD Loan Agreement, BYOD Student & Family Manual, BYOD FAQs, the MPS Acceptable Use Policy, and Chromebook Care & Use Policy, please visit the following flyer and click on the thumbnails to view the information. The end of the school year can be a stressful and busy time for parents/guardians and staff. 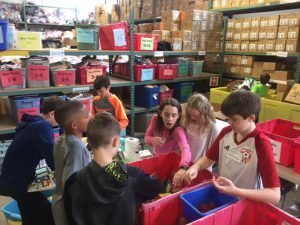 MPS SEL Facilitator Laurie Stillman shares some Tips for Taking Care of Yourself here. Some of our Collicot students will look a little different as they Buzz Off for Kids with Cancer in the coming weeks! 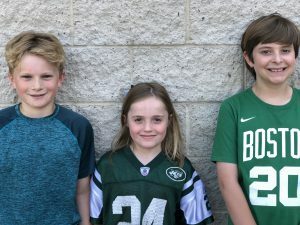 Jackson Wagner,Declan Shields and Christopher Ennis (pictured at left), are all raising money by getting pledges to buzz their hair to support kids with cancer. 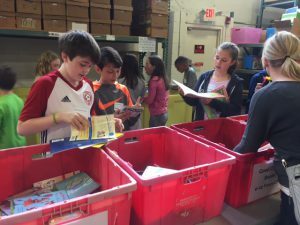 Our Glover 5th graders recently collected items and then volunteered at Cradles to Crayons as part of their fifth grade community service project. 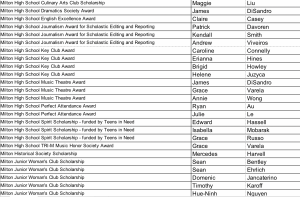 Thank you to these students for spending their valuable free time giving back to our community. The Milton SEPAC held elections last week and are pleased to announce the board for the coming school year. Co-Chairs: Jennifer Grubler (Cunningham, Integrated Preschool), Melissa Feldman (Pierce/Glover), Secretary: Jamie DeCaro (Integrated Preschool, Collicot), Treasurer: Clare Keating. Pierce Representative: Jessica Raider, Glover Representatives: Jenny Sheehan, Caitlin O’Neil Amaral, Collicot Representative: Amy Masferrer, Preschool Representative: Aldo Guerrero, Out-of-District Representative: Leslie Cheverie. The SEPAC is still see seeking volunteers to represent Tucker,, Milton High School, and Cunningham. If you would like more information or think you may be interested in serving next year, please email the SEPAC. 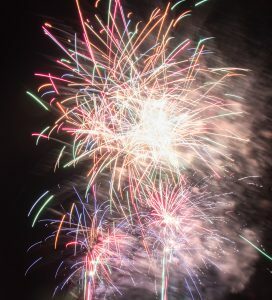 There are some fun events at the Eustis Estate in the coming weeks. Join them for the Vintage Base Ball Double-Header at the Eustis Estate, Boston Beaneaters vs. Providence Grays, Sunday, June 3 from 11am – 3:30pm and for the Head to Toe Family Programs on Friday, June 15 and Saturday June 16, 10am – 2pm. 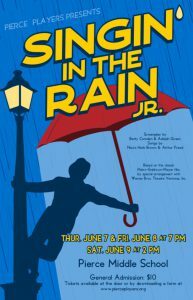 Details on both events can be found here. Last year, over 600 Milton residents and supporters walked and ran in Mike’s 5K to Crush Substance Abuse to keep a light shining on the substance abuse epidemic. We hope to have 800 people participate this year! Save the date for The 2018 5K Walk/Run on Saturday, October 20th. We have a few teams in the MIAA Tournament starting next week! Girls Lacrosse will finish their season against Ursuline on Thursday 5/31 at 4pm, before entering the tournament for the second year in a row. Boys Tennis will also be back in the tournament after beating Marshfield last Friday. Baseball will enter the tournament as the dark horse. They await the seeding next week to see where they will be traveling to. Softball will look to secure a tournament berth on Thursday 5/31 when they take on Weymouth. If they win, they will make the post-season for the first time in 9 years. Rugby enters the tournament undefeated in Division II, and they will hope to host a home game. Boys and Girls Track will be attending All-States at Fitchburg State on Saturday, 6/2. Good luck to all runners! Crew did well over the weekend – results can be found here. 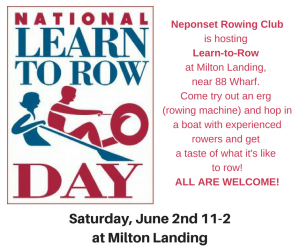 There is a Learn to Row session on Saturday June 2nd from 11am-2pm at Milton Landing. All are welcome! 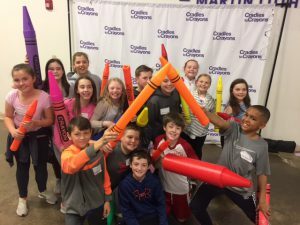 Students: On Saturday, April 7th over 100 students met at Clark University to participate in the Future Problem Solving State Bowl. 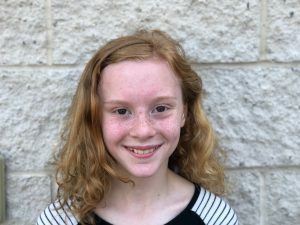 Among those students was our very own Collicot 5th grader, Ida Zoll. Ida competed in the Junior Division of the Individual Competition against other 4-6 graders. We recently found out that Ida’s problem solving abilities and precise action plan scored high enough to place her third in the entire state! 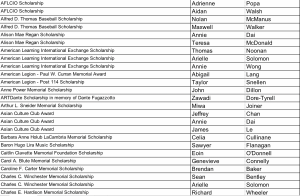 We are so proud of Ida and all of Milton’s Future Problem Solvers. Ms. Eberhardt and Ms. Morgan at the conference. 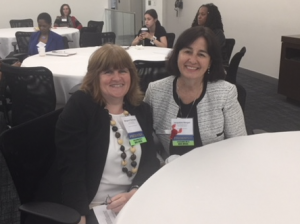 Staff and Volunteers: A huge thank you to School Committee member Margaret Eberhardt and MPS Director of Nutrition Services Jackie Morgan who this week presented at the Department of Secondary Education (DESE) conference on School Wellness and the Power of School Wide Collaboration. Ms. Eberhardt and Ms. Morgan spoke of how invested the Milton Public Schools is to working on our Health and Wellness initiatives, of the innovative work of Director of Health and PE Noel Vigue and the absolute success of our collaborative programs. 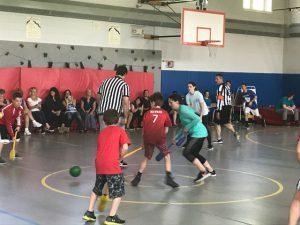 We are lucky to live in a town that is committed to the whole child and supports all of the Milton Public Schools health and wellness initiatives including the social and emotional health of our students and staff. Thank you to my blog contributors this week: Karen Spaulding, Karen McDavitt, Holly Concannon, Jon Redden, Laurie Stillman, Noel Vigue, Jackie Morgan, Ryan Madden, Elaine McNeil-Girmai, Cat DesRoche, James Jette, Maureen Kennedy, Brad Spindle, Karen Cahill, Marti McKenna, Bernadette MvEvoy, Brendan Bonn, Colleen Queally John O’Leary Pam Noonan, Barbara Perry, Linda Stefanick, Dawn Sykes, AJ Melanson, Tracy Grandeau, Jen, Grubler, Dawn Sykes, Bernadette Butler and Rebecca Damiani.